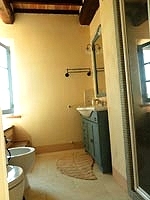 The recently renovated farmhouse is located in a peaceful area in the countryside south of Arezzo, in Valdichiana. 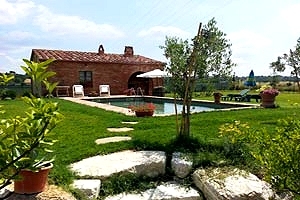 Situated at the confluence of Casentino, Valdarno and Valdichiana, Arezzo was founded in pre-Etruscan times in an area inhabited since prehistory. In the following centuries, Arezzo became one of the most important Etruscan towns, before being conquered by the Romans in the 3rd century BC. Works such as the necropolis of Poggio del Sole and the "Chimera" - a bronze statue representing the mythological monstrous female creature with the body of a lioness, the tail ending in a snake's head and the head of a goat at the centre of her spine - testify to the Etruscan origins of the town. In the 11th century, Arezzo became a free commune, which within the struggle between Guelphs and Ghibellines that brought bloodshed to Tuscan was defeated in 1298 by the Florentine and Sienese armies in Campaldino. 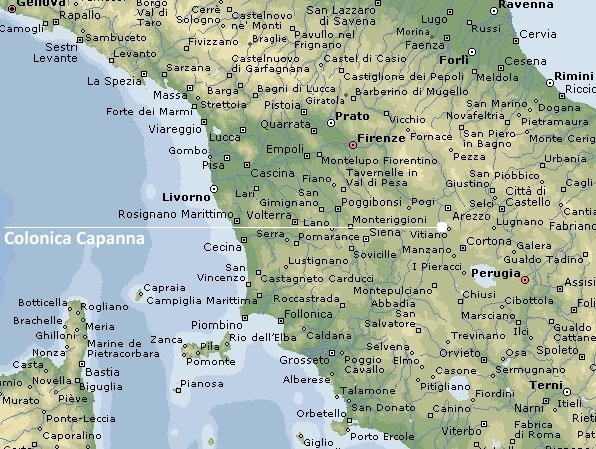 In the late 14th century, it was annexed to the Tuscan state dominated by Florence. Today Arezzo is renowned mainly for the "Legend of the True Cross", the wonderful cycle of frescoes by Piero della Francesca housed in the basilica of San Francesco, the antiques fair hosted in the historic centre on the first Sunday of every month and the preceding Saturday, and the "Giostra del Saracino". 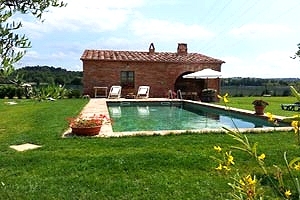 Surrounded by corn and sun-flower fields, the charming brick farmhouse is an excellent accommodation for those who dream of relaxing holidays in the heart of the Tuscan countryside. Culture lovers can visit important cities of art like Arezzo, Siena and Florence, which are easily reached by car for pleasant one-day trips, as well as many less-renowned but nevertheless interesting small towns such as Cortona, Monterchi, Caprese Michelangelo, Sansepolcro and Anghiari. 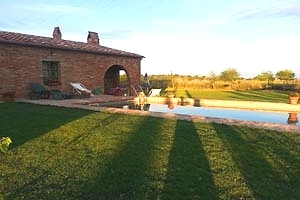 A stay at the farmhouse is an excellent occasion for gourmets to taste the Tuscan cuisine visiting Pienza (famed for its pecorino cheese), Montalcino and Montepulciano (renowned for their wines). 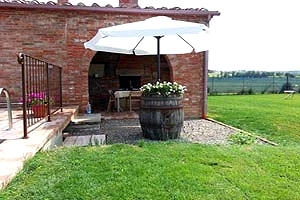 A riding stable, a golf club, a tennis club and Lake Trasimeno are just a few kilometres from the estate. 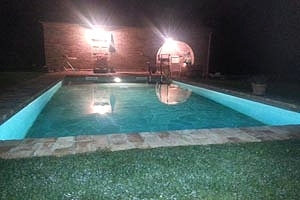 The private swimming pool (8x4 m; depth: 1.50 m) situated in the fully fenced garden a few metres from the house is furnished with sun loungers, deck chairs and a parasol. 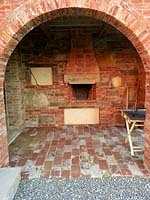 The entry loggia is furnished with a wood-burning oven. 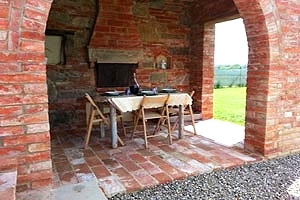 A table for dining al fresco and the barbecue equipment are at guests' disposal in the garden. 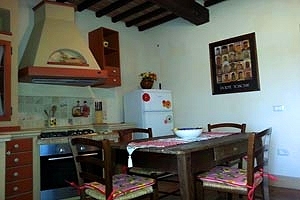 The one-storey building accommodates 4+1 guests and composes of kitchen, two double bedrooms and a bathroom with shower. 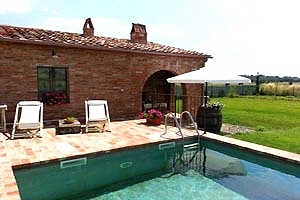 The farmhouse comes with swimming pool, wood-burning oven, Internet connection, fridge, freezer, gas cooker, electric oven, moka coffee maker, washing machine, cot bed and private car parking space. 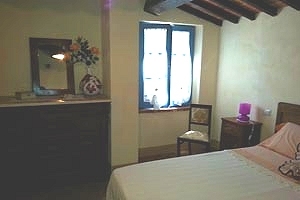 Food shops, a tobacconist, a cafe and a riding stable are 2 kilometres from the farmhouse. 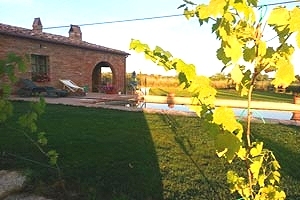 A restaurant is 5 kilometres from the estate. A golf club and a tennis club are 6 kilometres from the property.